(Reuters) - The U.S. Food and Drug Administration said on Tuesday it seized more than a thousand pages of documents from Juul Labs related to the company's sales and marketing practices after a surprise inspection, the latest clampdown on e-cigarette companies. The FDA said last month it was considering a ban on flavored e-cigarettes from Juul and others as the agency grapples with an "epidemic" of youth e-cigarette use that threatens to create a new generation of nicotine addicts. "Juuling," along with "vaping," has become a common term for e-cigarette use by teenagers on social media and at U.S. high schools. E-cigarettes vaporize a liquid that contains nicotine, the addictive stimulant that gives smokers a rush. The FDA also said it conducted inspections of several of Juul's contract manufacturing units earlier this year. "We've now released over 50,000 pages of documents to the FDA since April that support our public statements," Juul Chief Executive Officer Kevin Burns said in a statement, adding the meeting with the regulator was constructive and transparent. "We want to be part of the solution in preventing underage use, and we believe it will take industry and regulators working together to restrict youth access". The FDA's regulation of e-cigarettes has come under the spotlight as Juul's popularity surged. 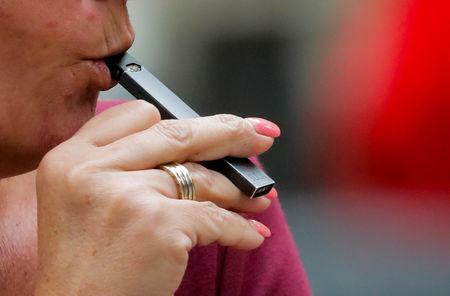 Startups and major tobacco firms have launched more than a dozen new high-nicotine devices with Juul-like designs since the FDA imposed the deadline, according to a Reuters review of the companies' online advertisements, social media posts and public statements. Shares of tobacco companies, including Philip Morris , Altria , British American Tobacco and Imperial Brands , jumped after the FDA announcement. Juul's flash-drive-like device is recharged via a USB port. The device comes with cartridges, or pods, of nicotine-based liquids in flavors like mango, creme and mint — that critics say appeal to minors. The newest liquid blends from Juul and its imitators - called "nicotine salts" in the industry - contain a compound called benzoic acid, which lowers the pH level of the liquid.